Palm trees blowing in hurricane-force wind. 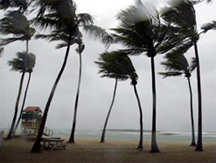 For some species of palm trees, survivability in hurricane force winds is excellent. Their leaves yield first, as shown in the photo. But the trunks are flexible too, and if the wind is strong enough, it can strip the leaves from the tree, greatly relieving stress on the trunk. For even stronger winds, the tree can topple, but unlike other species, toppling doesn't necessarily kill the tree. You might have seen some palm trees that seem to grow horizontally out of the ground. These trees are usually survivors of toppling. We can take some valuable lessons from the palm tree. If survival is the goal, flexibility is a must. Photo courtesy U.S. National Oceanic and Atmospheric Administration. We began exploring rapid-fire attacks last time, emphasizing response tactics that depend on assistance from others. But what if there are no others to turn to? What if others decline to assist? Options for targets depend to some extent on the relative organizational power of attacker and target. When the attacker has superior organizational power, targets have limited options. Some attackers tempt their targets to "lose it" by leading them to exhibit behavior that justifies organizationally sanctioned disciplinary action. Others intentionally inflict emotional pain. Attackers' motives vary, but for targets of powerful attackers, the only "safe" response — short of transfer or voluntary termination — is tolerating the attacks. To limit opportunities for their attackers, targets should avoid private meetings or other settings free of witnesses. And, of course, log everything. The more interesting case is the attacker who has little organizational power over the target. Perhaps attacker and target are peers, or close to it. In this situation, the target can choose the tolerance strategy described above, but that's unlikely to persuade the attacker to cease. By creating conditions that can make the attacker's behavior both obvious to management and harmful to management's goals, the three alternative tactics below can help to convince management to intervene. In response to verbal criticisms and attacks, targets can request further detail and criticism. Attackers are unlikely to interrupt such validating queries. Some attackers can thus be seduced into making stunningly outrageous claims and demands. When the attacker demands additional explanations or records, and assembling that information would consume resources management would rather not expend, the target can agree to comply. If a management representative is present, he or she will feel pressure to intervene on behalf of the target to prevent waste. If management isn't present, the target can later seek approval from management, which can compel management to intervene on behalf of the target. In these cases, targets should make clear that the compilation effort will delay other efforts already scheduled. have limited optionsthe requested information, targets can include excruciating detail and other ancillary information, so as to compel the attacker to demand further clarification. Plopping is a way of ignoring the attacker. Best used before witnesses, plopping can anger the attacker, which might lead to inappropriate behavior. To execute the tactic, the target pauses when interrupted by the attacker, waits for the attacker to finish, ignores whatever the attacker said, and resumes as if nothing happened. In effect, the attacker's words land with a "plop." While this approach seems superficially to be reasonable behavior, it is nevertheless extraordinarily irritating to the attacker. See "Plopping," Point Lookout for October 22, 2003, for more. Would you like to see your comments posted here? rbrenBbACvqyvefennNaaner@ChacAxBsLdOyNDxPoZldoCanyon.comSend me your comments by email, or by Web form. I offer email and telephone coaching at both corporate and individual rates. Contact Rick for details at rbrenZwhoMSjpcBaFWmMLner@ChacsxzaOQVljrYrRePyoCanyon.com or (650) 787-6475, or toll-free in the continental US at (866) 378-5470.